In a medium cast iron skillet or frying pan, heat canola oil over medium heat. 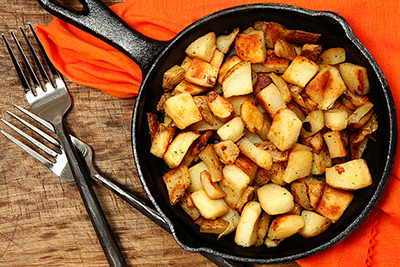 Add chopped potatoes to the skillet and fry for 4 to 5 minutes until the potatoes start to brown. Using a spatula, flip potatoes and fry for another 4 to 5 minutes. Continue to flip potatoes until they are pretty much browned on all sides and fork tender. Sprinkle with the ranch dressing packet and stir until the seasoning is mixed throughout the potatoes to create a light seasoned crust. Serve immediately while potatoes are nice and hot!